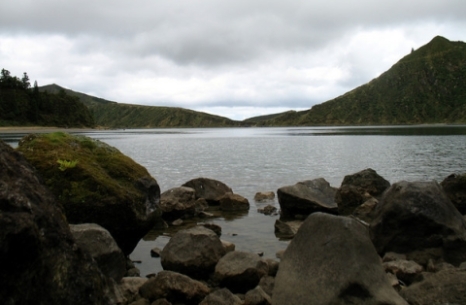 Lagoa do Fogo is a lake in the crater of an extinct volcano. It's a beautiful crater that is totally untouched because it is a protected natural reserve. It takes quite a drive to get up the mountain to see Fire Lake. I have been up the mountain many times in my visits to Sao Miguel but I never took the opportunity to make the hike down the crater to the edge of the lake. The first one is from the highest point that you can get to on the mountain range the contains the lake. Take note that the roads are modern, not the old cobblestone found elsewhere on the island. This makes the drive much easier. And this next one is looking out to the Island. Take note that you can see both the north and South sides of Sao Miguel from here. This next picture is taken from a spot you can drive down to and gain access to the North side of the Island (it's easy to get to Ribeira Grande from here). It also happens to be the spot where you can hike down to Fire Lake. I finally made the hike in August 2008. Most of my family had stopped to see the lake from the various lookouts on the South and West sides. And three of us decided that the light rain would make it a perfect day to hike down. It takes twenty to thirty minutes to hike down and it is challenging to do. The steps are very crude. I hesitate to call them steps because it could mislead you into thinking that it is easy to access the lake from the lookout. The steps vary greatly in height and width. Most of them are much higher than a normal step would be in a building. Several were waist high for my wife, Marcia. She's not much more than five feet tall though. But that gives you an idea. Here's one picture of Marcia taking a break to enjoy the view. You can see that there are beaches around the lake. I was surprised that the sand was quite soft. I expected it to be gritty and rough due to the volcanic origin. But it was actually soft to stand and walk on in bare feet. This next photo, was taken when we got down to the Lake and hiked along the shore. We were tempted to walk all the way around the lake. But we didn't have a lot of time and the weather was kind of threatening. If the on and off rain started coming down hard it could have turned into a miserable experience. So we decided not to test our luck. We enjoyed the view, and were happy to have been there. The hike up was the most challenging part of the experience. If your health is not good I do not recommend the hike down, because once you go down, you have to get yourself back up! Here's another picture that shows someone making the hike up. We made the hike up in good time. My legs were a little sore but it was invigorating and I look forward to doing it again. If you enjoy hiking I recommend taking the time to go down to Lagoa do Fogo. Return to Magical Azores Islands home for more articles and links.